The Vietnamese New Year, or as locally known, Tet Nguyen Dan or simply Tet, will take place on 05 February 2019. The day is also called Feast of the First Morning or shortly Tet and is the most important Vietnamese holiday. It is the feast of the new year after the moon calendar. The Vietnamese New Year (Tet) will take place on 05 February 2019. The day is also called Feast of the First Morning or shortly Tet and is the most important Vietnamese holiday. It is the feast of the new year after the moon calendar. The Vietnamese New Year festival is celebrated from the first to the third day of the first month of the Lunar calendar. According to European time, these data are approximately in the period of the zodiac Aquarius. Traditionally, Vietnamese visit their family and temples on this day. There are also special food to celebrate this occasion. New Year means, at the same time, the start of spring in Vietnam. The New Year tree is an important part of the Tet holiday. Cleaning is forbidden during the New Year’s feast – otherwise, according to Vietnamese popular beliefs, happiness will be swept out of the house. Tet, the Vietnamese new year, which is best expressed by the Vietnamese cultural identity, is the New Year’s festival, also known as Tet. Popular festivals often play a significant role when it comes to reflecting and preserving national cultural identity of Vietnam. However, January the 1st, is also widely celebrated as a New Year’s Day, but, the country’s main and most celebrated new years is Tet, the Vietnamese New Year. The word “Tet” comes from its Chinese root. This is a phonetic deformation of “Tiet,” a Sino-Vietnamese term, which means “the union of a bamboo star”, or more freely translates as “the beginning of the year”. The transition from one period to the next can bring meteorological changes (heat, rain, fog) that are to be accompanied by ritual sacrifices and festivities. So, there are several “tets” in the year (Mid-Autumn Vietnamese New Year, Cold Food Vietnamese New Year, etc.). But the most important of all is “Vietnamese New Year” or “Tet Nguyen Dan “). If you panning to travel within Vietnam during the Vietnamese New Year will take place in the last ten days of January, or in the first 20 days of February, in the period between the winter solstice and the spring equinox. Although the moon-dependent New Year is common throughout East Asia, each country celebrates it in its own way and according to its own national condition and its own culture. For the Vietnamese people, the Vietnamese New Year (Tet) is a mixture of Western New Year’s Eve, New Year’s Day, Christmas, Easter and Thanksgiving. It is the feast of purity and renewal. Nature is constantly renewing its youth, returning to its original youth and freshness. The people who are also part of nature follow the same rite. The Vietnamese New Year, which also marks the first day of spring, reveals the symbolism of the rebirth, which is also in the Easter festival. In the course of this period of universal renewal and rejuvenation, the Vietnamese peoples feel this spring break also in themselves. This feeling is also the cornerstone for special customs: every act, which is carried out during the three days of the Vietnamese New Year, should come into reality with well-meaning motifs As it is to be symbolic and forward-looking for actions in the next twelve months. Dishonesty or swearing should be avoided on these days. Even the most quarrelsome mother-in-law smokes the Peace Whistle with her sister-in-law during the Vietnamese New Year. Quarreling husbands buried their quarrel at this time. Children promise to be brave and adults give the children little presents – mostly coins, which are wrapped in scarlet paper, since red is the color of happiness. Also the children get new clothes and beggar alms. The “New World” is supposed to be the best of all worlds. As soon as the holy, silent time is over, the action begins again in a new frame, after opening celebrations: the “stamp celebration” for state servants, the “feather sponge celebration” for students and pupils, the ” For traders. For Vietnamese, the Tet New Year is a customer of trust in humanity and goes hand in hand with salvation, hope and optimism. Cleaning the house with decorating: Before the New Year, Tet holiday, the houses are often brought to a high gloss and are decorated and decorated. The children have the authority over the mopping and scrubbing of the soil. The kitchen must be clean before the 23rd night of the last month. As a rule, the household chair frees the ancestral tale of dust and ashes (of incense sticks). It is a widespread belief that the house cleaning spoils the bad luck of the old year. Some people paint their house and decorate it with festive decorations. New clothing: This is often the most exciting part of the Vietnamese New Year for the children. Usually, parents purchase new clothes and shoes for their children a month before the New Year’s festival. However, the children are allowed to wear their new clothes only from the first day of the festival. The best wardrobe is always on the first day of the year. Farewell party for the kitchen god (Ong Tao): Seven Days (the 23rd Night of the Last Moon Month) Before Tet, each Vietnamese family offers a farewell party for the Ong Tao to get to the Heavenly Palace. His task is to report to the Jade Emperor about the events of the last year, which were carried out in the family. The last day of the year: Literally translated, the festival means “Journey from Old to New Year”. A common belief among the Vietnamese people is that there are twelve Sacred Animals of the Zodiac, who observe and control events on Earth. Giao Thua (the last day of the year) is the day when the old head (in the year 2000 it was the dragon) ended his reign and transferred his power to the new head (in 2001 the serpent). So, Giao Thua is the time for Ong Tao (the kitchen god) to return to Earth after reporting to the Jade Emperor. Every family should hold a free-lance ceremony to welcome him back to their kitchen. The aura of the earth: Giao Thua is the holiest time of the year. That is why the first guest who sends his greetings is of particular importance. If this guest has a good aura (respected, educated, successful, famous, etc. ), the family believes that they will have happiness and abundance throughout the year. This belief in the “xong dat” still exists today, especially in families that run a business. Apricot and peach blossoms: Flower buds and blossoms symbolize a new beginning. 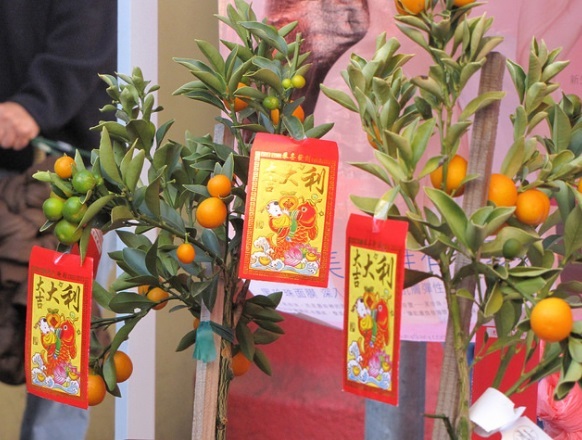 These specific plants are strongly in demand during Tet. Hoa Mai are the yellow apricot blossoms, which are often seen in South Vietnam. They are more adapted to the hot weather of the southern regions, and they are often used by the Vietnamese as the main flower. Hao Dao, this is the warm pink color of the peach blossom, which matures particularly well in the dry, cold weather of the north. Tet would not be Tet without Hai Mai or Hao Dai, which decorate the houses. Red gift wraps: This is a tradition that has been preserved for generations. The red envelopes symbolize happiness and wealth. In the days of the New Year festival you often see elderly people who give sealed red envelopes to younger ones. Before the younger ones receive their envelope, however, they must present a certain greeting. Here, for example, a greeting that would be paid to a teacher: “Thua thay, nam moi, con xin kinh chuc thay duoc doi giau suc khoe va gia dinh to khang thing vuon!” (“Revered Teacher, I wish you this New Year, With respect, severity and health, and to your family that she may live in peace and prosperity. “) – In return, the older gives good advice and wisdom, encourages the younger to maintain his school success, live harmoniously with others, and obey his parents. 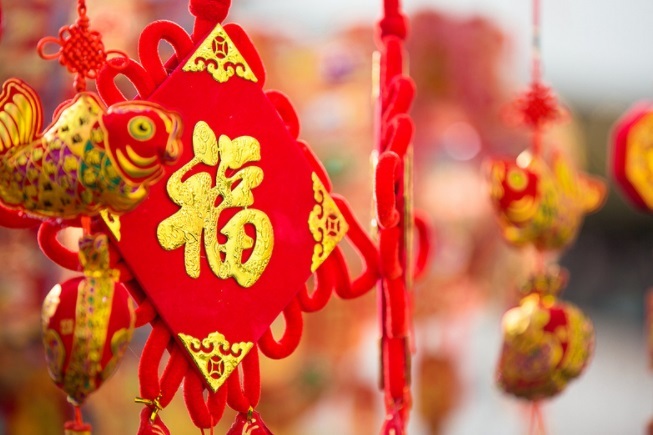 This welcoming ritual and Li Xi are also called Mung Tuoi, and honors the achievements in another year of life. Gifts for the ancestors: This ceremony is held on the first day of the New Year festival before noon. The board of directors is holding the ritual (offering food, wine, cakes, fruits and incense sticks) to invite the souls of the ancestors to attend the family celebration. During this time the families honor the souls of their ancestors and demonstrate their prosperity. A) A table with five fruits: A table with five different fruits is prepared at the altar of the ancestors, at every New Year’s feast, in every Vietnamese house. (B) Peach Blossoms: Each New Year, every household in the main town piles a large supply, but at least a small bundle of peach blossoms to decorate the house. C) Parallelism: Parallelism plays a major role in Vietnamese literature – in prose and lyric. He governs a particular genre, the genre of parallelism. D) The New Year tree: The New Year tree is part of a bamboo, five or six yards long, which is naked except for a small head at the top. Near the head is a round bamboo frame with some small fishes and small bells made of clay and sound softly in the wind. Under the framework are dedications and some thorny branches. At the top of the tree is a small kerosene lamp, which shines all night. (E) Traditional Tet images: The prints are used to promote the cultural history of Vietnam, and are relayed to younger generations through story tales at the beginning of each “new moon”. 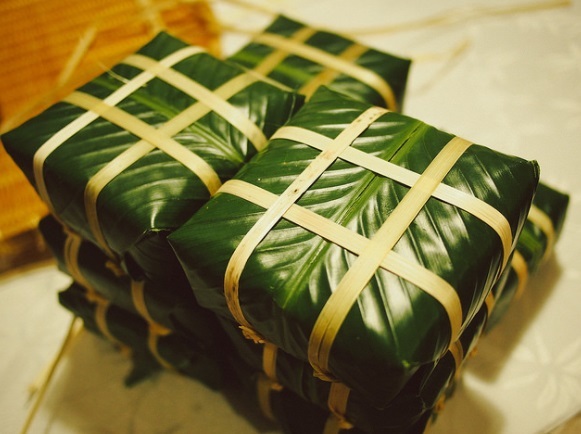 One of the most traditional Vietnamese food for New Year, Tet, is Banh Chung, sticky rice cake. Banh Chung, as the name suggests, consists of sticky rice, pork and green beans. Each ingredient is wrapped in a special leaf called Dong. Banh Chung requires care and accuracy at every single step. The rice and the green beans must be soaked in water one day before their processing in order to become more sticky. The pork is put into pepper for several hours. The chickens are shaped into a square and tied together with bamboo. Forming requires skilled hands. Banh Chung, among other foods, is indispensable at the altar of ancestors during Tet. The Banh Chung family used to prepare the hot fire place one or two days before Tet. Parents often told their children fairytales. Nowadays, families living in the villages still live in front of Tet Banh Chung, but the people of the cities no longer. Since they often lack the time, they rather buy the food in the shops. If you are traveling to Vietnam during the Vietnamese new year, you are advised to book a head, get your accommodation sorted out, buy your air ticket and know where will you travel in advance. Its new year and everything is fully booked from month in advance. Have a look and book vietnam tour deals from now!